Always consult your physician before beginning any exercise or dietary program. This general information is not intended to treat any medical condition or to replace your healthcare professional. Consult with your healthcare professional to design an appropriate exercise and dietary prescription. If any of these habits are deemed unsafe by your healthcare professional, do not follow them. If you experience any pain or difficulty with exercise or with food choices, stop and consult your healthcare provider. 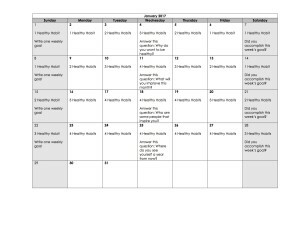 According to the calendar attached, each day we will choose a certain number of healthy habits ranging from 1-4 healthy habits to commit to per day. Each Sunday we will make a plan for the upcoming week, each Wednesday we will answer a question about our goals, and each Saturday we will reflect upon what we accomplished that week. 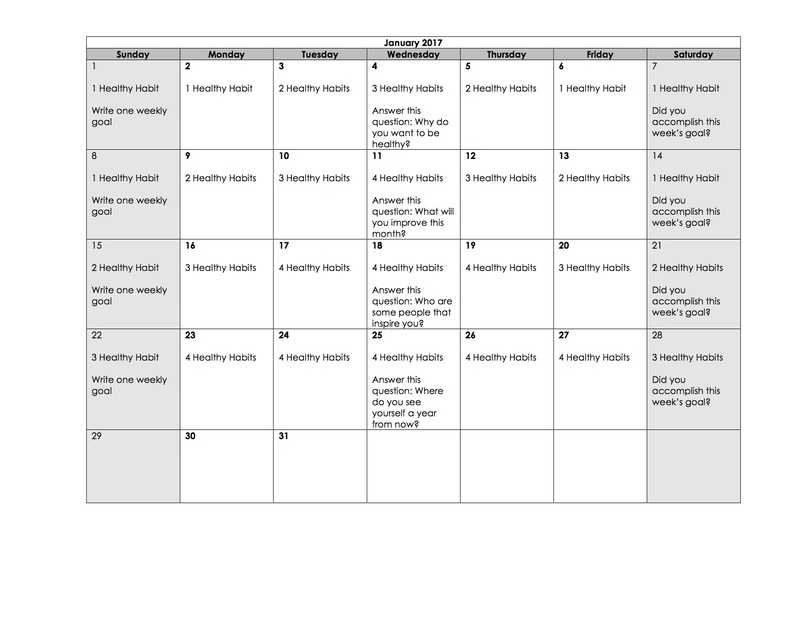 Note that you can change up which habits you commit to each day. You can also commit to more if you wish! The goal is to start small and work your way up. Yes, there will be prizes!!! Starting January 1st, every time you post something showing your healthy habit and hashtag #tolhealthyhabits to Facebook or Instagram you will be entered to win a prize. The more you post, the better your chances of winning! Drink enough water – one generic way to determine a water goal would be to divide your weight by 2 – this could roughly be your goal of water in ounces (for example, if you weight 150 lbs., 150 divided by 2 gives a recommended 75 ounces of water). Perform an exercise that elevates your heart rate for at least 20 minutes total in one day (could include light exercise, or higher intensity exercise – anything that causes you to increase your heart rate above a resting heart rate. Doesn’t have to be 20 minutes in a row. Can be broken into smaller chunks, like 10 minutes at a time). Get a serving of high protein food with each meal (see list for ideas). Eat a food item rich in Omega-3 fat (see list for ideas). Get 5-10 servings of fruits and vegetables. Increase the challenge of an exercise compared to the last time you performed (this could include resistance training (increasing sets, reps, weight lifted, and/or decreasing rest time) as well as cardiovascular exercise (decreasing rest time, increasing speed). Take at least 6,000 steps in one day. Choose mostly whole grains instead of refined grains (more than half of your servings of grains for the day are unrefined).